Sadio Mane scored the fastest hat-trick in Premier League history as Southampton demolished Aston Villa to keep their Europa League hopes alive. Mane's three goals came in two minutes and 56 seconds with Saints 3-0 up inside 16 minutes. The result means Southampton stay seventh with one game left and - despite the heavy defeat - Aston Villa sealed their Premier League safety after 18th-placed Hull lost. Saints felt they had an early goal wrongly disallowed when Pelle was flagged offside but it mattered little after three stunning minutes at St Mary's. Mane side-footed home on 13 minutes after Shay Given's initial save. He had his second when Long latched onto Ron Vlaar's poor backpass and the Senegalese was on hand to stick it away into an empty net. He created history with a fine first-time side foot from just inside the box to seal his hat-trick and also beat Robbie Fowler's 21-year record of four minutes 33 seconds for Liverpool in 1994. The goal prompted wild scenes at St Mary's and there was more to come with Long curling home from 12 yards for 4-0. 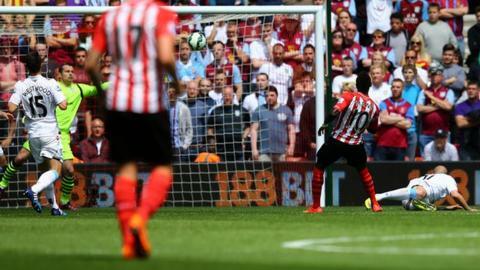 His second and Southampton's fifth was a stunning strike from 40 yards that flew over Given and into the net. Villa had a consolation on the stroke of half time through Benteke's header from close range in what was a breathless 45 minutes of football. Mane turned provider with 10 minutes remaining sending in a fierce low cross which Pelle thumped home from close range for 6-1. Saints end their season at Manchester City next weekend with Liverpool, Tottenham and Swansea also in the hunt for the two Europa League places. An Arsenal victory over Villa in the FA Cup final would also see seventh place earn entry into Europe. Villa host already-relegated Burnley on the final day of the season and their own Premier League status was be confirmed after Hull lost 2-0 to Tottenham on Saturday afternoon. "I enjoy it very much, we played great football and with great spirit. Aston Villa played offside and with a high line and left us a lot of space and you have to punish that. We had great movement and passing. "At 5-1 the human reaction is always to take it easy but we kept a good organisation in the second half and we scored a great team goal at 6-1. "It was an amazing afternoon and I didn't expect it I have to be honest but I was expecting a reaction after the last two games and it was great as it was our last home game. The fans deserved it for their amazing support." "The first 45 minutes of football there was not good enough. Southampton punished every mistake we made and we made quite a few. Everyone at the club has to take responsibility and we do, it was not good enough. "We've done brilliant over the past couple of months that's why we can't get too carried away. It's a defeat and a heavy defeat It's happened, we need to wipe our mouths and get on with it. "I have always said it will go right down to the wire and I believe it will. It's still in our hands. We had one foot in the Championship when I arrived and we have one foot in the Premier League now and we need to keep that foot in the Premier League." Match ends, Southampton 6, Aston Villa 1. Second Half ends, Southampton 6, Aston Villa 1. Attempt saved. Gabriel Agbonlahor (Aston Villa) right footed shot from the centre of the box is saved in the bottom left corner. Assisted by Christian Benteke. Attempt missed. Ashley Westwood (Aston Villa) right footed shot from the left side of the box is too high. Attempt saved. Gabriel Agbonlahor (Aston Villa) right footed shot from the centre of the box is saved in the centre of the goal. Assisted by Alan Hutton with a cross. Corner, Southampton. Conceded by Alan Hutton. Substitution, Southampton. Eljero Elia replaces Graziano Pellè. Substitution, Aston Villa. Scott Sinclair replaces Jack Grealish. Goal! Southampton 6, Aston Villa 1. Graziano Pellè (Southampton) right footed shot from the centre of the box to the high centre of the goal. Assisted by Sadio Mané with a cross. Ron Vlaar (Aston Villa) wins a free kick in the defensive half. Substitution, Southampton. Filip Djuricic replaces James Ward-Prowse. Attempt blocked. Christian Benteke (Aston Villa) left footed shot from the centre of the box is blocked. Attempt missed. Nathaniel Clyne (Southampton) right footed shot from the centre of the box is high and wide to the right. Attempt saved. Maya Yoshida (Southampton) header from the centre of the box is saved in the bottom left corner. Assisted by James Ward-Prowse with a cross. Attempt blocked. Graziano Pellè (Southampton) right footed shot from the centre of the box is blocked. Assisted by Victor Wanyama. Substitution, Southampton. Maya Yoshida replaces Steven Davis. Victor Wanyama (Southampton) is shown the yellow card for a bad foul. Substitution, Aston Villa. Matthew Lowton replaces Leandro Bacuna. Corner, Aston Villa. Conceded by Paulo Gazzaniga. Corner, Aston Villa. Conceded by Steven Davis. Attempt missed. Shane Long (Southampton) right footed shot from the centre of the box is close, but misses to the right. Assisted by Graziano Pellè with a cross. Attempt missed. Shane Long (Southampton) right footed shot from the right side of the six yard box misses to the right. Assisted by Victor Wanyama with a headed pass following a corner. Corner, Southampton. Conceded by Shay Given.